If you aren’t a chocolate fan, you are most definitely on the wrong post. 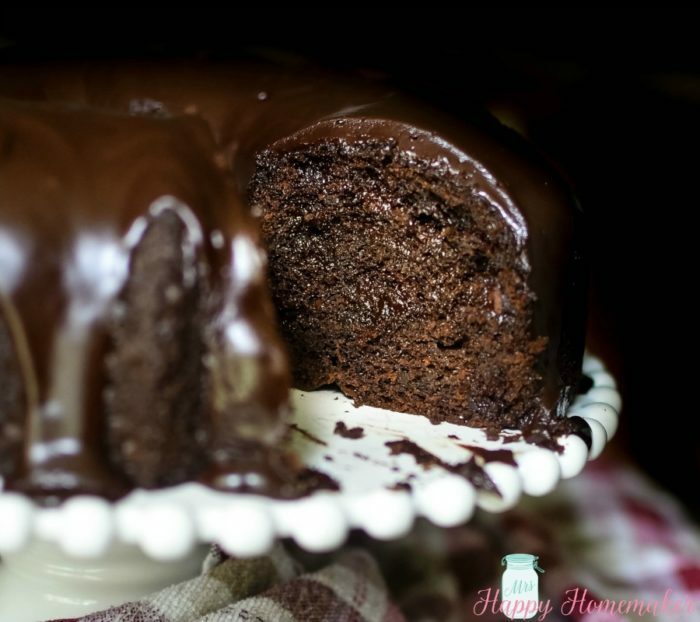 I am about to introduce you to the easiest, fastest, richest, most chocolate-y cake you will ever have. This recipe has won me a few 1st place ribbons in some local fairs several years ago (when I had time to dabble in that sort of thing!). It really tastes like something you’d get at a fancy dancy restaurant, but it’s the simplest cake to make. Not gonna lie – basically this is just jazzing up a cake mix. Never has a jazzed up cake mix tasted this good though. I’m willing to bet on it. Not much though – I’m not really much of a gambling person. Like, I’ll bet a piece of gum on it. An imaginary piece of gum. I mean, I don’t know what kind of magic doctored up cake mix recipe you have up your sleeve, but if it’s better than this… call me. We need to be friends. You bring the cake, I’ll bring the milk. All joking aside, this is one of my favorite cakes ever. 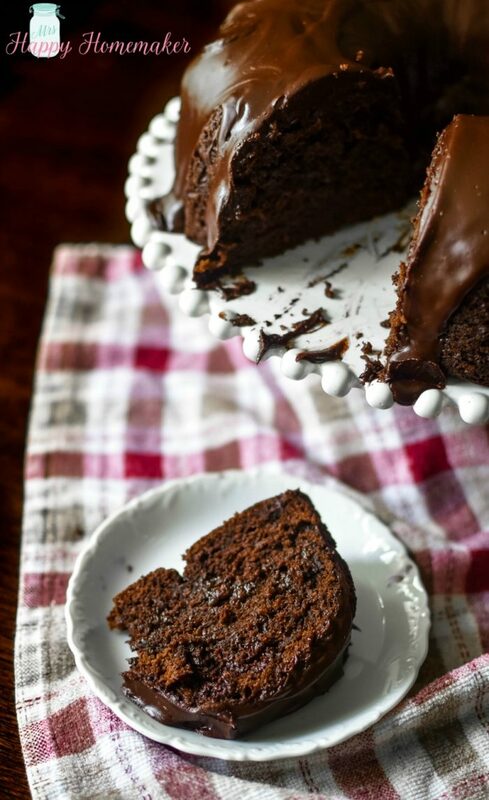 It actually ties in my favorite chocolate cake department with this 100% from scratch chocolate sheet cake recipe. I love them both equally, but this one is simpler by a long shot. To make it, I start with a box of devils food mix. I stir in eggs, oil, milk, sour cream, chocolate chips and chocolate pudding. 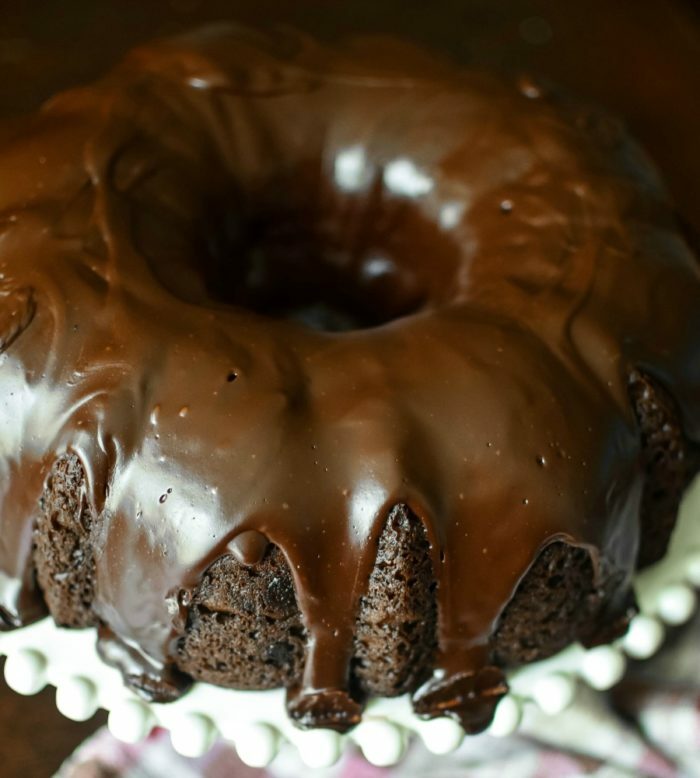 Then after it’s baked, I give it a satiny chocolate glaze bath. Satiny chocolate baths are the best, after all. This cake is the definition of decadent. In a large bowl, mix together the cake & pudding mixes, sour cream, oil, beaten eggs, and warm milk. 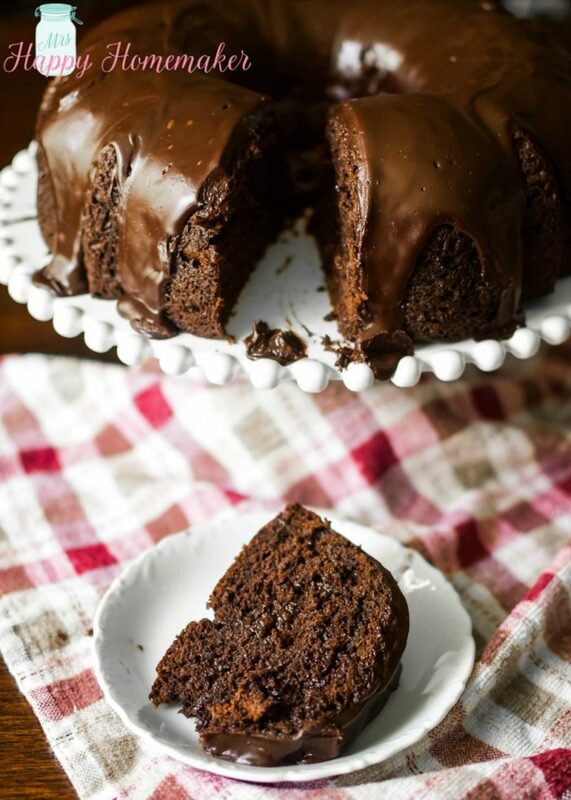 Stir in the chocolate chips and pour the batter into a well greased 12 cup bundt pan. Bake for 50-55 minutes, or until the top is springy to the touch & a toothpick inserted into it comes out clean. Cool the cake thoroughly before removing it from the pan. In a double boiler over hot, not boiling, water – combine chocolate chips, butter, & corn syrup. Stir until the chips are melted and the mixture is smooth, then add in the vanilla extract. 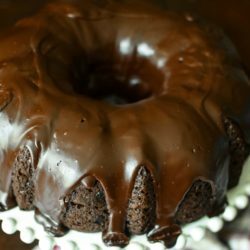 Pour or spread the warm glaze over the cooled bundt cake, letting it drizzle down the sides. If you’re feeling a little nutty, you can add some toasted pecans or walnuts to the top of the glaze while it’s still warm.